"Hello Scott, You possess invaluable knowledge. Your products have got to be the best on the market today because you believe in dealing with the most important "muscle" and weapon on the planet: THE BRAIN !!! This is, without a doubt, what every combative program or system needs for the real world. I know because I'm a multiple black belt holder with over 39 years of experience in the martial arts. This includes real-life street combat experience and elite U.S. Army unit training and combat experience in Central America. However, I'm constantly striving to learn more and apply myself. Thanks for the pertinent information you provide!" "I Greatly Appreciate What You Have Done For Me and My Family! Thank you. DOMINATE any violent encounter with Complete Combat’s “End-It-Quick-and-BRUTAL” tactics. 8 Joint Cranks to Seize and Control anyone.. and more! Complete Combat is based on Martial Science. NOT Tradition, Sports, or Gurus! And Gives You True “Martial” (Warrior) Art. This is the kind of Martial Arts that can save your life, that the masses don’t know about, and that can turn you into a more powerful, deadly and confident person in your own right! Stopping violent criminals and murderers and rapists cold is one of the most important life-skills you can possess. Only a COWARD would disagree. These are SURVIVAL skills to end it quickly and brutally. And that’s only where we START. I want to welcome you to a world you may not have known existed. A world where you walk with power, poise, peace and confidence because you know you can handle anything the forces of darkness try to throw your way. This is the world of the COMPLETE COMBAT Martial Arts Practitioner. A world you now have an opportunity to join. When your skills are “outside of the box” and not limited by tradition and rules, you have a very powerful advantage. Think you can handle a real street attack because you go to the gym and grapple around? I don’t want to offend anybody, but I seriously doubt it! What they’re teaching at the McDojo’s and Gyms Can Get You KILLED. Sure, they’re great for a physical challenge and a good workout, but when it comes to PAIN, DAMAGE and DEATH – they don’t teach that realistically at all! Reason #1: They came up in a karate school “franchise” with it’s rainbow of belts and rote memorization of watered-down “pull your punches” techniques and organized “kata” movements. Don’t get me wrong, I love that stuff. It has all kinds of benefits. It’s a genuine art form! But…The Only “Art” in a Real Street Attack Will Be the BLOOD, SKIN and TEETH Smeared and Scattered All Over the Pavement… Hopefully Not YOURS! Reason #2: They came up in the ring with it’s rules, regulations, and judges. They’re physically tough and fairly proficient, but so is just about ANY active athlete from any sport! Regardless of How Tough You Are in Training – the Street is NOT the Mat – it Has No Rules, No Referee, and it is NOT SOFT! Your Attacker is not bound by rules and regulations. He isn’t worried about pleasing judges or losing points. He doesn’t give a damn about the law, or hurting… and possibly even KILLING you. Am I speaking clearly enough for you? Or do you think this is all a bunch of “sales hype”? If you do, then read no further and I wish you all the best. But if you’re the kind of person who knows the truth when they hear it, and you want the kind of skills and information that is only available to the elite, this is what you’ve been looking for. Complete Combat is the most thorough and powerful violent knowledge available today that is easy-to-learn. Normally 297.00, now only 97.00 through September 12th! + 1000 in Free Bonuses! I’m Scott Bolan. If you’ve been around the martial arts and mental training worlds for any length of time, you probably know who I am. As a lifetime Martial Artist starting formal training at the age of 8, I’ve earned multiple Black Belts and Advanced Certifications. But I don’t need to mention someone else to bring me attention, and I don’t have time for all of that political BS. I’ve done it all when it comes to martial arts and combatives, and I spent years and traveled far and wide to get the very best to keep on the “cutting edge” of martial knowledge. I’ve also worked in security and high-risk collections, been in numerous real-world streetfights, attacked with sticks, knives, multiple attackers, and more. If you don’t think that qualifies me as a person with valuable information to share with you, then read no further. Enjoy life in your dark cave or your mom’s basement. However, if you realize I know what I’m talking about and you want to quickly learn how to fight with devastating power and multiply your martial force no matter what level you’re at, you’re in the right place. 1) Fighters: They can beat the hell out of almost anyone. When you try to learn from them, they practically beat the hell out of you. You never learn a damn thing, while they get your cash and an ego boost. If you’re a follower, you’ll fit in well with guys like this. They will probably take advantage of you, and resent you if you ever leave them or have your own ideas. 2) Technicians: They’re always telling you things like “your foot is off an inch”, etc. They “package” things to no end, and try to trade-mark a hook punch. At their rate, it will be years before you ever free-spar or truly learn how to really fight. They’ll keep you mixed up in technical gobbledygook while you keep paying. 3) Mentor: Like the ancient “Shinobi” (keeper of the secret) and “Shihan” (master teachers), I will directly share with you every brutal and deadly fighting secret I have discovered in my 30 plus years of Martial Arts, in a way that is easy to understand and quickly learn. No games. No gossip. No ego. This is the kind of teacher I am: I want you to succeed. I’ve combined a lifetime of Martial Arts and Warrior Skills into a practical and easy-to-learn program. … because if your current system doesn’t fully and effectively address every single one of these, it isn’t COMPLETE, and you are walking prey. Right now you can quickly change all that and complete your knowledge and skills arsenal. The COMPLETE COMBAT program gives you the very best of what actually WORKS, so you can learn for your self 300x faster than everyone else out there, without having to waste time at some expensive gym. True Martial Arts is not an athletic sport, and not Sunday school. But that’s what they’re teaching out there! If you walk the Warrior’s Path and want “the Real Deal,” Complete Combat is for you. It’s a great feeling to Become DANGEROUS, Stronger and Safer. You’ll notice that you walk into a room and radiate confidence, and you’ll feel powerful and at peace wherever you go. I’m so confident you’ll love this I guarantee it with a 30-day no-hassle refund. Is that fair? 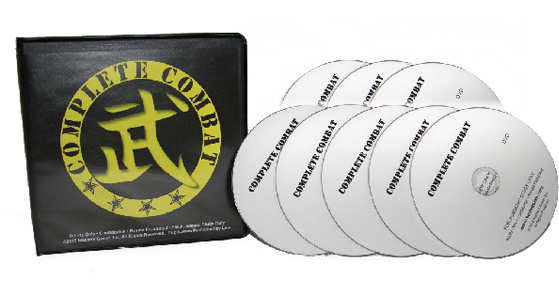 The Complete Combat System 8-DVD Digital Home Study program is normally 297.00 but the price is slashed to only 97.00 through September 12th at midnight! This special Huge Discount offer and the Free Bonuses are available ONLY through September 12th, so Order Now!